Property Owners: List your Alsace property on the premier site specialising in French holiday lets. More Info. Accommodation options leave you spoilt for choice, but a gite holiday is well worth considering, and an Alsace gite can be an experience you’ll never forget. Gites are so unique and authentically French that you really feel like you are a part of the country and not just there as an outsider. If you decide against the gite option, an Alsace villa takes a lot of beating, as they are well appointed and, like a gite, enable you to conduct your holiday at your own pace. 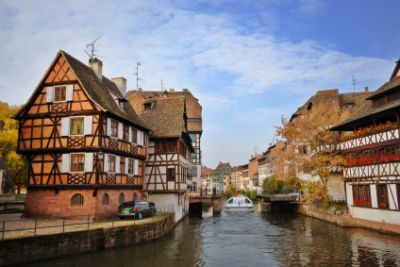 Wine tourism is big business in Alsace, so don’t miss out on a journey along the Wine Route, especially if you happen to be there in October, when the culmination of the grape harvest is accompanied by festivals in and around the pretty, attractive villages. As the route covers 170 kilometres and takes in 100 villages, you won’t be able to do the whole thing, but as a form of compensation, there are tastings galore wherever you go. While you’re sobering up, spend a few days in Strasbourg, a truly beautiful city, packed with interesting architecture, theatres, galleries, entertainment, excellent restaurants... in fact everything an MEP could desire to help him or her wind down after a tough day legislating! But that jarring note aside, Strasbourg really is a fascinating city, and one which visitors fall in love with time after time. Among those places not to be missed is La Petite France, an area once inhabited by millers, tanners and fishermen, with half-timbered houses that have been standing for over four hundred years, and arguably the most picturesque part of the city. Other sites to take in are the medieval Strasbourg Cathedral, reflecting an almost fairytale charm and sereneness, and the modern-day contrast of the European Parliament building, even if it’s just to check on how wisely your money is being spent. If it’s night-time thrills and spills that you’re after, you can’t go wrong with a visit to The Royal Palace, France’s third largest cabaret. Situated in Kirrwiller, it’s an unforgettable evening’s entertainment that only the French can provide. Featuring international cabaret artists from all over the world, you won’t see better anywhere, and it makes for a wonderful climax to the perfect holiday. Alsatian cuisine is heavily influenced by its close neighbour Germany, and many of the traditional dishes feature pork. One of its more famous gastronomic delights is Choucroute, a regional version of Sauerkraut, which is served as an accompaniment to poultry, Strasbourg sausage, pork and even fish. Other dishes to try are Baeckeoffe, a casserole dish that’s based on mutton, pork and beef, and Flammekueche, a bread dough rolled out thinly and covered with fromage frais or crème fraîche, onions and little cubes or strips of pork fat. Alsatian food is usually served in large quantities, so you’ll never leave a restaurant feeling hungry. When it comes to drinks, Alsace is rightly proud of its wines, and ís noted for its Rieslings. It’s also the traditional production base of Schnapps and, being the major beer-producing region of France, is not short of breweries, so for those who like to try something long and different, you’re in the right place.